Having a work addiction might not be good for your health but the same could be said of people suffering from work withdrawal. What is work withdrawal? In many ways, it is the coming to terms with the fact that your work just didn’t turn out to be as great as you had once hoped. We all start our careers full of hope, confident that with the right attitude and effort will we achieve our goals but for most of us, we get let down, our bubbles are burst and we withdraw. The addiction we hoped we would have with our jobs, that deep connection that would make work worthwhile, is lost. Meanwhile, as an employer, you are seeing sales declining, profits shrinking, people quitting, customers complaining and going elsewhere. Morale is low and it feels like nobody cares. As an employee research company we see it too. Our Employee Engagement Index is only 67 on a 0-100 scale so there is a lot of room for improvement. These are all signs that your employees are suffering withdrawal and the clues are probably staring you in the face. Apathy: instead of being positively motivated to solve problems, attempt to work with a supervisor or with co-workers to change working conditions, there is no interest and no effort. Nobody is trying and there is a sense that no one cares. Planned exit: in order to avoid the source of their dissatisfaction, employees explore their options like quitting, transferring, or retiring as a way out. It might not be obvious but, while they are working, employees are fantasizing about their options. Nobody wants to be stuck doing a job that brings them down. Avoidance: these employees look for more short-term strategies to avoid dissatisfaction, such as coming to work late or leaving early, avoiding meetings or duties while at work, or deciding to take a day off. Absenteeism is a classic withdrawal symptom. Retaliation: definitely a worst-case scenario where employees get back at their employer by stealing, sabotaging production, gossiping, backstabbing or making life miserable for others. This is how you know money is not as important as you think because if it was the only thing that mattered, nobody would have a reason to want to get back at you. Employees who feel they are giving more than they are getting will want to get back at you if they feel you have taken advantage of them. 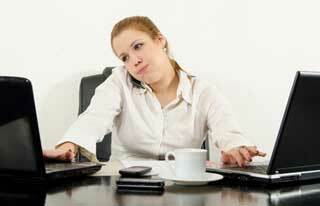 There is a known cure for employee withdrawal and it is called employee engagement. And of course you care about employee engagement and understand why it matters, so you should be taking advantage of the best tool for measuring it: employee engagement surveys. Employee engagement surveys tell you what’s working, what isn’t and what you need to fix and make better before your team disengages or quits. When you commit to your employees and decide to take action, you can turn a bad situation around and you can expect to experience the benefits that positive change can bring about. An employee engagement survey is not the be-all and end-all of engagement solutions but it is the first step to figuring out what’s best for your organization. We have written a Guide to help you understand more about why and how to survey employees and we invite you to read it and benefit from our experience and knowledge. We are addicted to employee engagement and we we can help you make work a better place! Please contact us here.